New Earth Reality is associated with the qualities of heaviness, matter and the terrestrial world. It automatically removes negative patterns, sending them into the Earth, and re-energizes your strength with the stream of positive energy from Mother Earth. This energy brings calmness, practicality, patience and honesty. It amplifies the energy of Mother Earth as it flows into us. *Positively increases stability, endurance, strength, calmness, patience and mental health. *Is an incredibly strong grounding tool. *Promotes health, wealth, prosperity, good relationships and manifestation. *Improves fertility, vitality, emotional balance, etc. *Heals our past-life negative patterns and unlocks the wisdom. 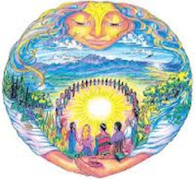 *Connection with the spirit of Mother Earth and all its manifestation form. Activation of this energy is done by intention and requires no symbols. A meditation is provided in the manual to help you further connect to the energies of Mother Earth. It can be used for self-healing, and the healing of others both in person and at a distance.